This is a cream to powder foundation that feels velvety soft and glides on like a dream. It is a red-ish mother of pearl shade that gives a rich sun kissed glow. This is darker than I am used to but for the first time in my life....I look Sicilian. Like I have been sun bathing near the coast. It retails for $55 and is available at Saks. 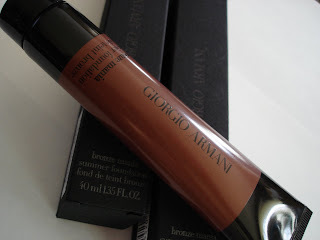 Disclaimer: A press sample of this product as provided by Giorgio Armani. Is this just a summer item for Armani? I am always looking for the Holy Grail of transluscent, beautiful foundations.